Review “Der Rosenkavalier” (Lyric Opera): Long and Luscious! 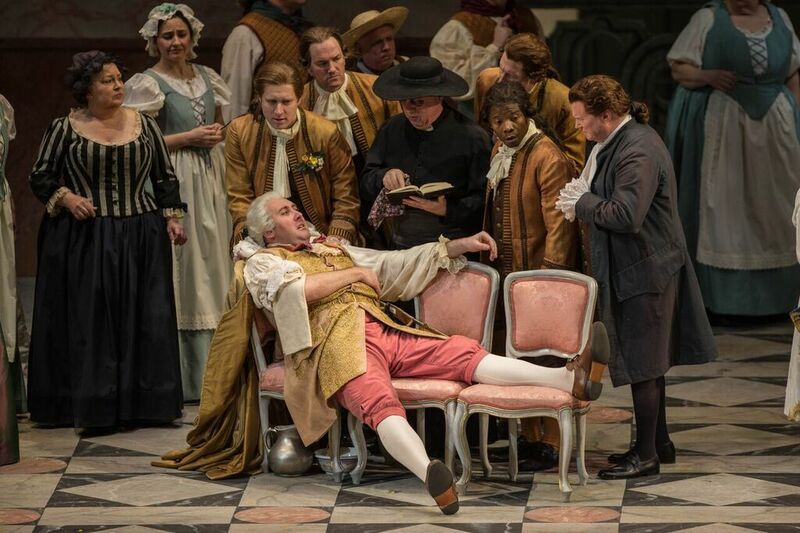 Lyric Opera of Chicago presents DER ROSENKAVALIER. Love and lust is in the air this winter at the Lyric. Richard Strauss composed an opera driven by desire. The curtains open on the pillow talk between Sophie Koch (Octavian) and Amanda Majeski (The Marschallin). 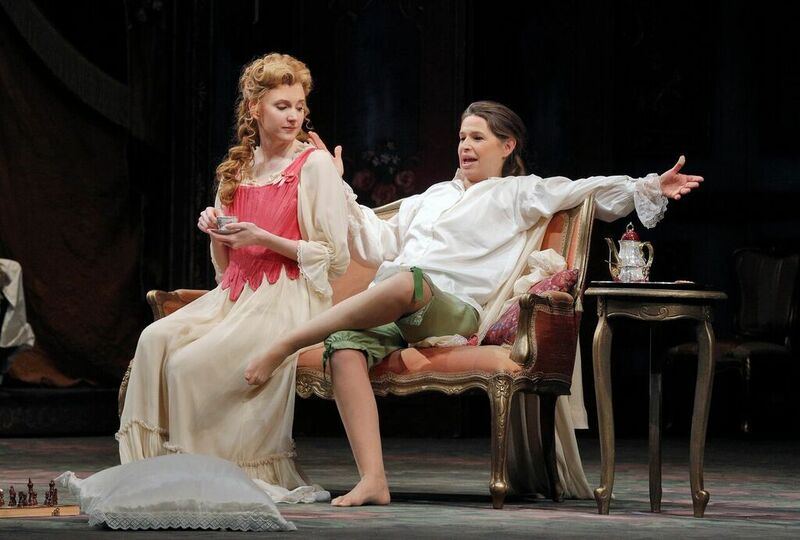 Mezzo-soprano Koch is playing a seventeen year-old boy and lover to the princess. Majeski, the princess, is enjoying the attention of the young count while her husband is gone. When their frolicking is interrupted by the insistent Matthew Rose (Baron), Koch disguises himself as a maid. Rose is immediately smitten by Koch who now is playing a man playing a woman. Throughout the opera, Koch transitions effortlessly from gender to gender. She transforms into earnest lover, coquettish maid and dashing cavalier with distinction. Her performance has depth as we see her grow up on stage. She goes from eager boy-toy to confident rescuer. Her duet with Christina Landshamer (Sophie) Mir ist die Ehre is sung exquisitely. Their duets together build on each other. It goes from a casual flirtation to a committed engagement. Their growing pledge of devotion to each other is visibly and audibly beautiful. Strauss wrote a composition of love sonnets. Some of the arias are plucky. Some are sweetly sincere. And some are haunting. Conductor Edward Gardener ensures the emotional intention is felt all through the theatre. This is especially true with Majeski’s searing solos. In Act 1, she vulnerably sings about aging. There is a palpable sadness under her words. In Act 3, she is in recovery mode from her despair. Her decisions are breaking her heart but she is majestically poised. Hab mir’s gelobt is the ultimate love triangle love song for Majeski, Koch and Landshamer. Along with the rom, there is plenty of com. Rose brings the buffoonery to this romance. The commanding bass uses his large stature to punctuate the his pompous demands. Rose’s overbearing personality makes him the target of an elaborate hoax in Act 3. Originally, the deliciously devilish Megan Marino (Annima) and Rodell Rosel (Valzacchi) work for Rose. They hide behind plants and tattle with comedic flourish. When Rose fails to pay them, Marino and Rosel change allegiance. DER ROSENKAVALIER is a long love story. Four hours and ten minutes long. At my performance, vacant chairs increased as the time went on. For me, DER ROSENKAVALIER is the perfect heart-warming story for a cold winter’s evening. Strauss took his time telling this story. And this superb ensemble won’t rush to finish it. Instead, they savor every passionate morsel of it. And I did too. SIDENOTE: As a special treat, the curtains will stay open during Act 1 and Act 2. The audience is invited to watch the scenery transition narrated by Stage Manager John W. Coleman. It was a behind-the-scenes tour without leaving my seat. Pretty cool and unique experience!